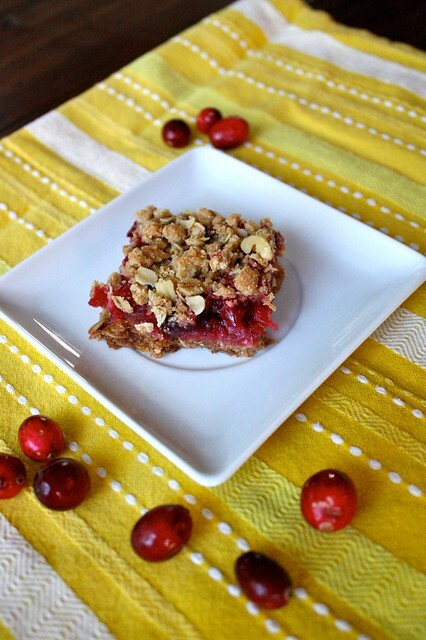 Cranberry bars in tow, we attended our neighborhood holiday party this weekend. I know it's not really a meatless monday post, but they were pretty enough to share all the same. Spiked with lemon zest, these bars are a tart treat amongst a dessert tray of sweet cookies. cranberry sauce atop baked crust. Stir nuts into reserved oat mixture. Sprinkle oat and nut mixture atop cranberry sauce. Lightly pat oat/nut mixture into sauce. Bake for 25-30 minutes more or until top is golden. Cool in pan on a wire rack. Cut into bars – makes 24. Can freeze bars. To serve thaw 10 –15 minutes at room temp. ** I make cranberry sauce. Follow instructions on the back of cranberry bag. Now these look and sounds delish!